Haggis is already partly cooked when you buy it. The best method of cooking is to place it in a lidded saucepan covered with water. Bring to the boil, then reduce the heat and simmer for 1-1 ½ hours. If you are very short of time, you could consider microwaving your haggis, but this does tend to dry it out. Place the haggis in a microwave proof dish with about 100ml water in it. Split the outer skin of the haggis. Cover the dish with pierced cling-film, and heat for 5-10 minutes on high. Allow 250-300g floury potatoes per person – King Edwards, Maris Pipers, Estimas, Desiree or Romano are all good varieties. Peel your potatoes, and cut into equal size chunks so that they cook evenly. Cover with water, add a good dash of salt and bring to the boil. Boil for about 10-15 minutes until they are just tender, then drain well. Return to the pan and add plenty of butter (at least 75g per person – this is not diet food!) and a good seasoning of salt and pepper. Take your potato masher and mash the potatoes to death. Pummel them until there are no lumps left. If your potatoes seem a bit dry, add more butter or a dash of milk or cream. In other words, diet tomorrow, and enjoy the feast today! 1 large Swede will provide enough mashed swede to feed 4. Peel your swede using a very sharp knife and a great deal of care. Cut in quarters, and then cut these into thin slices. Cover with salted water, bring to the boil and then simmer until tender – in my experience this takes at least 40-45 minutes. Drain well and return to the pan over a low heat – this drives the excess water away. Add a good knob of butter, salt and black pepper, and once more exercise your arms and mash well. Swede does not make as smooth a mash as potato, but is delicious nonetheless. Very Rich, very delicious. This quantity will feed 4. Sweat over a very low heat 1 medium finely chopped onion in about 30-50g butter until softened. This should take about 15-20 minutes. Turn up the heat and pour in 75-100ml whiskey. Boil for a minute to burn off the alcohol. Add 250ml lamb, beef or chicken stock, and boil to reduce by half. Then add 250ml double cream, and continue boiling until it is thickened to the consistency that you like. Check seasonings, and serve a small amount with your haggis, neeps and tatties. 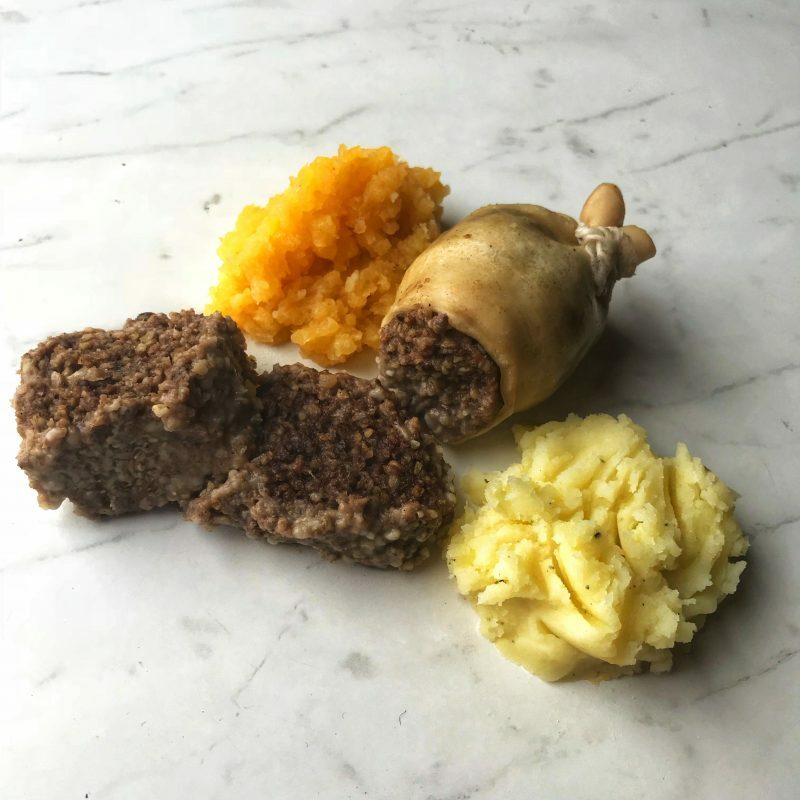 This entry was posted in Blog, Recipes and tagged haggis, mashed potatoes, neeps, potatoes, roast, swede, tatties, whiskey.